WITHIN 36 hours of Tuesday’s unprecedented, humiliating, crushing House of Commons defeat for Theresa May and her cynically misnamed EU ‘Withdrawal’ Agreement, which would lock the UK into a permanent Brussels vassalage even more oppressive than membership, her intended direction of travel in response is already evident. It is towards further concession, capitulation, and finally surrender. In her immediate post-defeat statement, and during both Prime Minister’s Questions and her contribution to the subsequent debate on Labour’s unsuccessful motion of no confidence, May has repeated the same robotic bromides which have characterised her conduct of the Brexit negotiations since inception. She had, she purported to assert, no intention of revoking Article 50; she has, she professed to insist, no plans for a second referendum. But her words are hedged about with caveats which make her pledges ring hollow to the point of being meaningless. 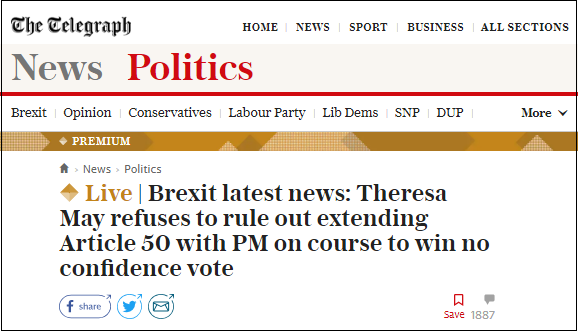 She did rule out revoking Article 50, but she did not do the same when quizzed about the prospect of asking the EU for extra time to negotiate beyond 29 March: and then later talked about it being conditional on EU agreement, thus acknowledging the possibility of it by implication. She ostensibly ruled out a second referendum, but committed herself to ‘establishing what would secure the consent of this House’. Given the overt support among the Commons’ anti-Brexit majority for the speciously named ‘People’s Vote’, that isn’t especially hard to divine. May’s promissory notes are issued in devalued currency. She pledged not to call an unnecessary election, and then did. She declared after both her Lancaster House and Mansion House speeches that no deal was better than a bad deal, only to conclude now that any deal, however bad, is better than no deal. She laid down numerous non-negotiable Red Lines for Brexit discussions, only to abandon and retreat from them. Little she says can be believed. The signals of upcoming surrender are coming fast. ‘Sturgeon is expecting a phone from Theresa May later this evening as she starts reaching out to other parties,’ reported the BBC’s Scotland editor, Sarah Smith, not long after the Government defeat. The outcome of that isn’t hard to guess, either. ‘The Government is incapable of winning support in this House for her deal on its own,’ observed Jeremy Corbyn, for once accurately, and ‘must consider ideas that are negotiable and that have the sufficient support in this House.’ In reaction, May has quickly committed herself to ‘listening to the views of the House so that we could ascertain what it is that would command its support’. Well, we know what those are. They are, in reverse order of preference, ruling out a no-deal WTO-Brexit, an ultra-soft Brexit, a Brexit-In-Name-Only, and ideally no Brexit at all. In my view May will almost certainly concede both an extension, if not outright revocation, of Article 50, and a second referendum. She will feign reluctance, but actually be delighted. In conceding both, she will be considerably assisted by the procedural amendments in the way House of Commons business is arranged. I described the initial stages of that process, facilitated by apparent pre-arrangement, in secret, between the now stridently anti-Brexit arch-Remainer Dominic Grieve and a blatantly-biased Speaker Bercow, in the footnote update to my own website’s blog a few days ago. That, it turned out, was indeed merely the enabler. With subsequent developments, it became clear that the Grieve-Bercow agreement of Wednesday 9 January to bring about the alteration to Parliament’s rules was not a one-off, but the precursor to, in effect, a constitutional coup d’état by anti-democracy Remainer MPs to reverse Brexit, ideally via a second referendum with the choice to all intents and purposes between Ultra-Remain and Remain-By-Another-Name. To understand the full import, it’s worth reading this exposition by Number Ten’s former director of legislative affairs. The effect of Grieve’s and his like-minded colleagues’ aims would be to make elections based on party manifestos meaningless, because backbenchers would be able not merely to oppose but to legislate: and, via just a few rebels from the party in government combining with the Opposition, to enact laws directly contradictory to the mandate on which the Government in office was elected. A recipe, in other words, for legislative mayhem, democratic deficit and constitutional chaos. By this means, in the specifically Brexit context, the caucus of about 20-30 resolutely anti-Brexit ‘Conservative’ MPs clustered around Grieve, Morgan and Soubry would be able, in conjunction with the Opposition parties, to legislate for a second referendum, the deferment or cancellation of Article 50, and even the postponement, if not reversal, of Brexit itself. At the conclusion of yesterday’s Prime Minister’s Questions, Grieve introduced into the Commons a Bill to give effect to these changes. First and Second Readings were both set for next Monday. The Remainer coup is under way. The fix is in. May’s ruling out a no-deal WTO Brexit is now sadly a certainty, and her conceding on both Article 50 and a second referendum before then can’t, I suspect, be ruled out. She will not want to risk another humiliating defeat. Parliament will have wrested control from the people it asked for an instruction in order to disregard and overturn it because the people’s instruction was not to its liking. Where what’s left of democracy goes after this is anyone’s guess. 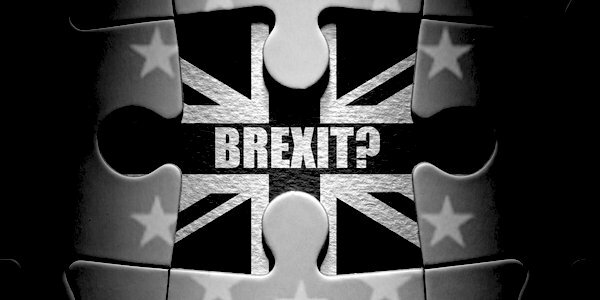 Next articleReader’s comment: Who pays for Referendum 2?